They brought five of the capital's landmark traffic junctions to a standstill for a festival of protest - not all of it entirely peaceful. Last November, Extinction Rebellion forced Westminster, Lambeth, Waterloo, Blackfriars and Southwark Bridges in London to close, issuing a statement that read, "Extinction Rebellion demands that the United Kingdom government immediately tells the truth and declares a climate and ecological emergency, that it reverses inconsistent policies and reduces to net zero greenhouse gas emissions by 2025, and creates a citizen's assembly to oversee these changes". 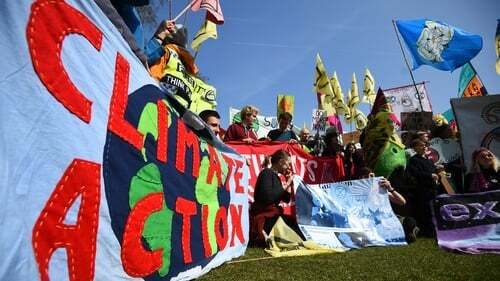 The protests were initially thought to be peaceful, blocking five central London locations as they demand the Government declare a climate emergency. "We need to disrupt the system that through no fault of its own, is geared to destroy our planet", the group said. They have left us with no other option. The International Rebellion is meant to force governments to agree to Extinction Rebellion's demands. Monday will see protesters in around 80 cities in more than 33 countries hold similar demonstrations on the same environmental issues, campaigners say. Demonstrators began arriving in Hyde Park on Sunday and while organisers encouraged people to set up camp there overnight, they have been warned they could be breaking the law by doing so under Royal Parks legislation. A police officer on the bridge said the Met could impose limits on assembly if they felt there was a serious risk of disruption or to public order.